Hippos have long fascinated humans around the world. Referred to as the “river horse,” the name given to them by the Greeks, it is surprising, to say the least, to see one in Mexico. They are native to Africa, spending most of their lives beneath rivers and lakes. They can spend up to 16 hours a day underneath the water to keep themselves cool. “Tyson” the hippo, as locals of Las Chopas have named him, has been keeping himself cool by roaming nearby ponds and swampy areas. He was spotted on March 20. Many people have been seen giving him food, such as watermelon. 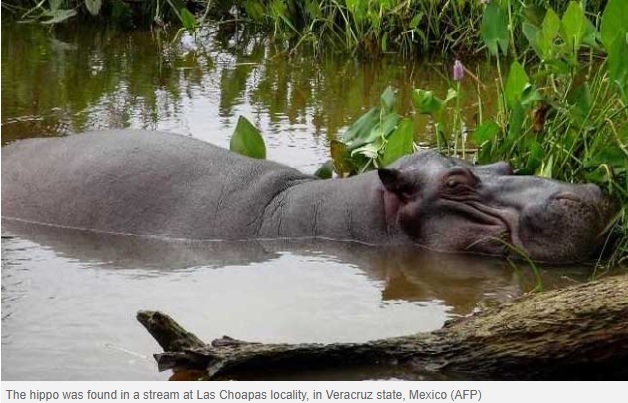 According to the authorities in Mexico, they are worried about the hippopotamus roaming in a swampy area of southern Mexico. The hippo was spotted near a garbage dump back in January. Now, in the Gulf State of Veracruz, it resides in a swamp. No one seems to know where it came from. Yet, some are speculating that it came from a drug kingpin’s exotic pet collection. According to NDTV, “a herd of hippos once owned by late drug lord Pablo Escobar has invaded the countryside near his former ranch, a massive problem for the local authorities.” Whether this is true or not is just speculation. Environmentalists claim that it is unclear how Tyson — which weighs 1,320-pounds (600 kilograms) and is approximately three years old — got into Mexico. Right now they are trying to figure out how to safely capture him and relocate Tyson to a safer place. Not only safe for him, but safe for the public as well. Hippopotami have been known to charge unsuspecting victims, which can lead to death. Authorities have stated that local environmentalists are figuring out how to capture Tyson. 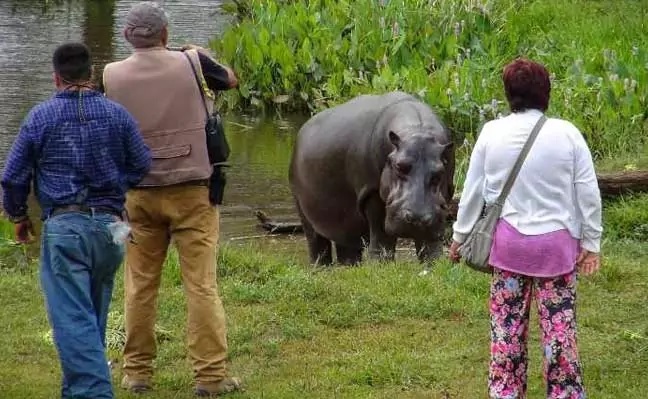 They also advice local citizens to not go up to him seeing as how hippos can be quite aggressive. Since hippos are native to sub-Saharan Africa, they can only survive in areas with abundant amounts of water. Because Tyson is in a swamp in Mexico, he is a potential danger to the surrounding environment and ecosystem. Hippos can eat up to 80 pounds of grass each night. If there were any fruit in the area, Tyson would have scavenged for it at night. That too would have been terrible for Las Chopas. In fact, we know that hippos, like all invasive species, do damage to the environment they find themselves in. One famous drug kingpin, Pablo Escobar had hippopotami within his exotic pet collection (according to lore). They’re now running rampant in Colombia. He used to let visitors come in and visit his “zoo.” But now, there are between 26 and 28 hippos living in the lake at the Hacienda Napoles. There has also been some evidence that several of these hippos have moved onto the Magdalena River, and possibly other areas as well. If not managed they can multiply to somewhere in the 100s. “If they get aggressive they pose a risk to Colombian biodiversity. They could displace native fauna,” David Echeverri Lopez, a biologist from the regional environmental corporation, told AFP. They are a danger to the ecosystem. Lopez goes onto say, “It is an invasive species and very resistant to everything. They carry diseases that can kill livestock. They pollute the water courses where they defecate.” Their large waste discharge can create an accelerated process called eutrophication. This leads to an overabundance of nutrients in the water. In turn, this leads to more production of algae or other harmful microorganisms. Because of eutrophication, the areas will see more dead fish and less oxygen in the water. Since hippos are territorial creatures, it is possible they could take over areas where local animals reside. Not to mention, if locals hunt them for their meat, they risk the possibility of spreading disease.